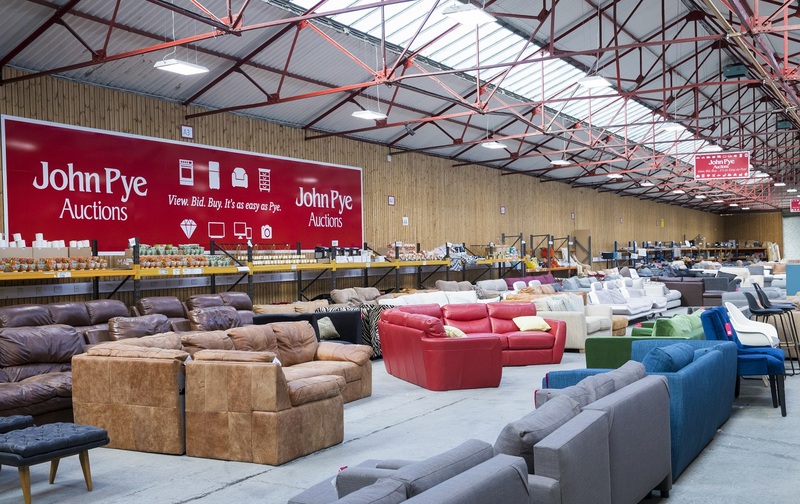 UK award winning John Pye Auctions is celebrating £50million in sales and its 1,000th auction at its flagship hub in Marchington, Staffordshire. The company’s 11-acre West Midlands site, which showcases 11 salerooms across 180,000 sq. ft of indoor sales space, has sold more than 1.5million lots since it first opened back in August 2012 with three full time staff. The site now employs 110 full time staff at Marchington as it celebrates its milestone 1,000th auction on Friday 29th March. Family owned John Pye offers secondary market bargain hunting customers everyday retail goods at discounted prices, including home furnishings, tech and gadgets, children’s toys, home appliances, vehicles, designer watches and luxury jewellery. John Pye works for more than 80% of UK retailers clearing surplus stock holdings from failed deliveries, damaged packaging, seasonal end-of-lines, insurance write off stock and customer returned products. The company has recently launched a new division at its Marchington site - John Pye Technical - which offers refurbished tech items complete with parts and labour warranties, with plans to roll out the division across all sites in its UK network. The most popular items sold at Marchington have included sofas, beds, mattresses and white goods sourced from top high street retailers such as John Lewis and Made.com. Some of the most unusual items that have been up for grabs include a fleet of ex-ambulances, a fire engine converted into a party bus, a 2016 McLaren 570GT and a Formula 1 Grand Prix racing car from the 2016 F1 season. Footfall to Marchington’s public viewing days continues to grow and the auction house welcomes in excess of 2,000 weekly visitors to its site. Over 400,000 registered bidders have participated in sales to date, generating over £50million in revenue. Since opening, the Marchington hub has cemented its position in the community, raising funds and providing support and considerable contributions through charitable initiatives and sponsorship of grassroots sports. Its recycling and waste management scheme has benefited both the environment and local economy with the creation of a number of jobs in the area, as the site works towards its zero-waste strategy objective in 2019. The multi award-winning national auctioneer celebrated its 50th anniversary last year and reported a record-breaking trading year in 2018, with the company seeing significant growth in online bidders, as well as increased footfall across its UK auction showrooms. The business expanded into the international market with the launch of its first online auction in the United Arab Emirates last December, and in 2019 alone John Pye has announced the opening of a new Birmingham office, its second largest auction facility to date in Chesterfield and the expansion of its Nottingham headquarters. Growth is set to continue for the Marchington site with the company predicting a 15% increase in revenue over the next 12 months, and a 50% increase over the next three years. “Our Marchington site has been incredibly popular since opening and it’s a huge achievement to reach the 1000th sale milestone. “I have been working at John Pye for 13 years now, having started as an auction porter before later being promoted to associate director and head of national retail facilities for the company. The 1,000th online sale at the Marchington site will go live on Friday 29th March 2019, with public viewings taking place on Monday 25th March between 10am – 2pm.